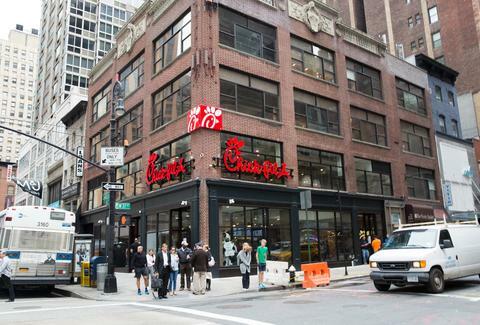 Love it or hate it, Chick-fil-A's first standalone restaurant in NYC has attracted long lines of hungry New Yorkers since it opened last fall. But you won't see anyone queuing up for that crispy goodness on Monday, because the outpost remains closed after a recent city health inspection discovered several major violations. The company voluntarily closed the restaurant on December 30th, following a Christmas Eve inspection by the NYC Department of Health that detailed 59 violation points, or enough points to get slapped with the city's far-from-coveted "C" letter grade (although there's currently a "Grade Pending" sign in the window). Inspectors cited the massive restaurant near Herald Square for six violations, including several "critical violations," such as failing to store cold food at a safe temperature and the presence of filth flies. A previous, ungraded inspection on December 15th resulted in 39 violation points, so it appears conditions actually worsened from the first inspection to the second, according to the DOH website. Chick-fil-A said the key issue is evidence of flies, presumably in the kitchen and food preparation areas. "There were six violations on the last health inspection, so we decided to voluntarily close the restaurant so that the team could focus solely on those issues – primarily the presence of fruit flies," said Chick-fil-A spokeswoman Amanda Hannah in a email statement to Thrillist. "There is a little more work to be done from a facilities, maintenance and retraining standpoint, so we have decided to remain closed today until we feel everything exceeds standards." Chick-fil-A also issued a press release announcing the temporary -- but extended -- closure and a series of changes the restaurant will make to clean up its act, saying, "These changes have included retraining the leadership team and employees, fruit fly mitigation and thorough cleanings of the restaurant, independent inspections by an outside consultant, and equipment and facilities upgrades." Neither Hannah nor the press release said exactly when the restaurant expects to reopen. When Chick-fil-A first opened the restaurant last October, Thrillist got a sneak peak inside, including the food preparation areas, which you can check out here. Chick-fil-A announced it reopened the restaurant on Tuesday morning, and issued the following statement: "Chick-fil-A at 37th and 6th has re-opened for business. We opened on Jan. 5th at 6:30 a.m. following the completion of our voluntary shut-down to perform maintenance and facilities updates. We appreciate our customers’ patience and look forward to serving them soon." Tony Merevick is Cities News Editor at Thrillist. Send news tips to news@thrillist.com and follow him on Twitter @tonymerevick.